Having your Assemblage Point adjusted helps to shift emotional issues and helps one re-focus. The human energy field extends around us about as big as our outstretched arms (actually much bigger) and is rather egg shaped. It is an field that is in motion. By definition all oscillating and dynamic energy fields have an epicenter or center of rotation, and for people it is called “The Human Assemblage Point”. It is called the assemblage point because when we are born it is located at the navel which is the point from which we grew, or were assembled via the umbilical cord. By the time the child reaches the age of seven or eight, and if they have had a well balanced happy childhood, this point centers itself in the chest, a bit higher for girls then for boys. After that if we experience any trauma, physical, emotional, spiritual or sexual, this point can shift, and if the shift is too far it cannot migrate back to the optimal position. Also if the trauma is severe enough (this degree of severity differs from person to person) the point can fracture or perhaps mirror into two or more positions. Through these points the body receives information and processes it at a subconscious level to create our thoughts, and as we know our thoughts create our reality. As an example if a point is located on the lower right quadrant in the liver area, that person will no doubt be experiencing low physical energy and some degree of depression. There are a variety of conditions or emotions associated with various positions on the front of the body. After locating these positions by scanning and muscle testing, the point or points are gathered in order of strength and shifted to the optimal area (in the chest). The client then rests for 20 minutes. The position is checked in 14 days and then monthly after that until the position holds. Normally three or four sessions are all that are required unless the client is experiencing continuing traumatic events in their life. Adjustment of the Assemblage Point is a modality that lends itself to distance work using a surrogate to locate the points and do the adjustment. These adjustments have been done for clients around the world with great success. You may do a local "in-person" adjustment, or have a distance adjustment. Both ways show superb results. There is a way to help others with anxiety, worry, depression and emotional draining issues. Learn to adjust The Human Assemblage Point. Instead of looking at or bodies as living machines, we know they are a gigantic network of energy; the place where spirit, matter and power connect. 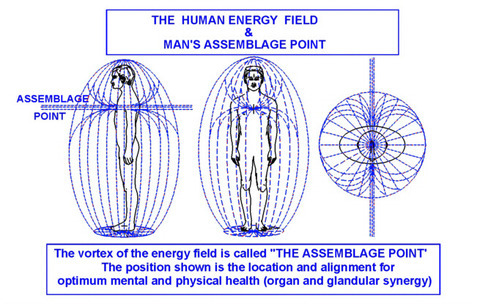 The position of our Assemblage Point, a vital energy vortex in the body, is a primary determinant on our state of health, affecting not only “how we feel” but “how we behave”. When we access the quantum biological energy fields which surround all living beings, it becomes possible to treat disease both physical and mental in exciting new and non-invasive ways. Take part in an Assemblage Point Class. Email Dennis to let him know you are considering a class. CLICK WORKSHOPS to see more information.